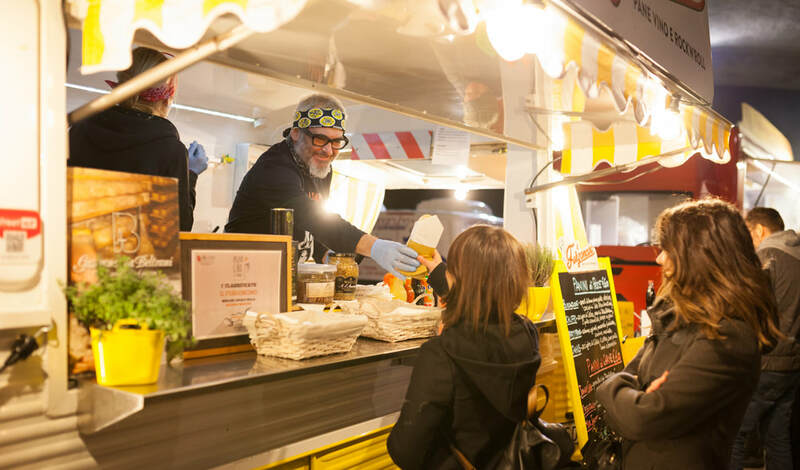 Whether your event will host food vendors, product or craft vendors, or if you'll be bringing in catered food or making it yourself— ​it is helpful to gather some basic information about what your potential waste streams will look like. Will/or can there be reusable service-ware options? Follow this link to consider how you can host an event using only reusable service-ware. Are there containers for food and drinks? If so, can you reduce the variety by working with vendors ahead of time? What other give-a-ways will vendors be handing out? ​Here are some ideas to help you to plan ahead and ways to communicate your guidelines to vendors. Below are some areas to consider incorporating into your event food guidelines. Please refer to our Sample Vendor Letter for tips on communicating your requirements to vendors. Require that vendors/caterers provide drinks and condiments (water, tea, sugars, ketchup, salad dressings, etc.) in bulk instead of in individual packages and servings. OR- require that vendors/caterers buy those that are sold in recyclable containers. Provide List of acceptable recycling: Provide your vendors with a list of acceptable/ not acceptable items. This will help prevent unwanted items showing up day of the event. Option: Ask your vendors to all use the same containers to avoid confusion. Food Scraps including, meat, dairy and all vegetable waste. Here's the complete list. Compostable food containers, or paper products (food soiled paper plates, napkins, paper cups). Milk containers, juice packs, straws, etc. If you are working with a catering company, ask them to provide only washable/reuseable containers. Most catering companies are willing and able to comply with requests to compost food scraps, use reusable to-go containers, and limit the amount of waste, when requested. Follow this link for a list of local catering companies. Whenever possible, use either catering supply companies for reusable items or locally source items for serving and eating food, such as tablecloths, silverware, glasses, mugs, plates and cloth napkins. Follow this link to learn more about local resources for hosting a zero waste event. If reusables aren’t an option for the caterer or vendor that you select, use only recyclable materials, as compostables are not currently accepted at any Central Vermont commercial composting company. We lend out bus bins for setting up your own dish-washing station! With help from volunteers, you can choose reuseable service-ware for your event. click on the button below to reserve your bins today. limit the number of give-a-ways (business cards, brochures, packaged samples, etc). make sure all distributed items are reusable, recyclable, or compostable (food items). allow participants to select only the items they actually want (rather than handing them out to everyone). distribute items to attendees that will help them to reduce waste and restore environmental quality in the future (e.g selling cloth bags, native plant seeds, potted plants, etc).